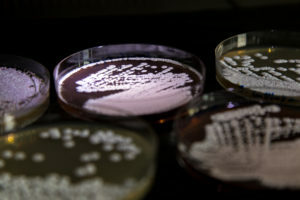 Since the paper ‘Dissemination of antibiotic resistance genes from antibiotic producers to pathogens’ was published in Nature Communications the 7th of June, and afterwards was written as a news article in a less scientific language, it has received huge media attention all across the globe. For more than 30 years, scientists have proposed that resistance genes actually originate from the microorganisms producing the antibiotic. Now, research shows for the very first time that antibiotic resistance genes originate from the same place as the antibiotic compounds, i.e. from a group of soil bacteria called Actinobacteria. According to Altmetric, that collect and collate data to provide information of the online activity related to publications, the article has been published by 15 different news media. This includes Science Daily, Science World Report, Scicasts, Le Scienze (Italian edition of Scientific American), Muy Interesante and Videnskab.dk. Thus, it currently ranks in the top five percent of all research outputs scored by Altmetric, and as number 1,821 out of 159,174 outputs of similar age.